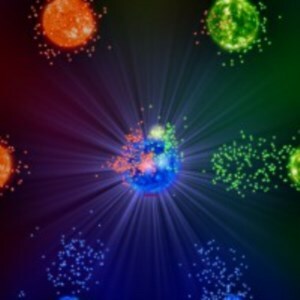 Auralux is a simple realtime strategy game available on the Android and iPhone platform. It’s free to download with available in-game purchases. The concept behind Auralux is nothing new, but has been created with beautiful graphics paired with pleasing sound effects. My personal opinion is the computer AI is very basic. So despite the nice design, the levels are easy to beat. In fact, I don’t think I lost to any of the included nine levels (more levels are available for purchase that I did not buy). The mission of the game is as follows. When the game starts, there are many planets, represented by a simple circular faded planet. Depending on the size of your planet, units are created that can be used to upgrade to larger planets for a higher rate of unit production. The other option is to venture out and conquer unclaimed planets. Your goal is to destroy your enemy and conquer all planets. At the end of each level, statistics are graphed out including the population of each team along with when planets are taken. The first level is a very easy tutorial that explains all the rules for the game. Without much pressure of losing, the tutorial teaches you how to navigate the map, zoom in and out, and move and attack with your units. Control of the game is very intuitive, though I sometimes have problems scrolling around the map. There isn’t a way to speed up the game. You can make an in-game purchase that gives you the option to speed up all levels, but that hardly seems worth a purchase. The computer AI is not strategic enough. Something is wrong with the AI. I understand making a game too difficult can turn off some players, but there isn’t an option to adjust the difficulty of the AI. I literally beat all the included levels without ever losing (and I’m not the most strategic player). There isn’t a multiplayer option. Playing an AI is fun and good for learning how to play, but having an online component would give Auralux more replay value. All in all, I enjoyed playing the included nine levels of Auralux, but now that I beat the entire game in a couple of days, I do not intend on keeping the Android app installed. The game has some rebalance to the custom map Zone Control in the original Starcraft, so Auralux does bring back good memories. If this sounds like a game you might like, stop over at https://www.auraluxgame.com to see trailer videos and screenshots.